In fact, he loved cigars and found smoking very relaxing. 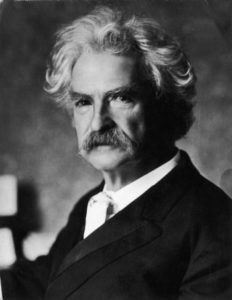 His father died of pneumonia when he was 12, and Mark Twain became an apprentice printer at the Missouri Courier. Later, he wrote for local newspapers. The author also worked as a riverboat pilot on the Mississippi river. He got his pen name, Mark Twain, from steamboat slang for 12 feet of water. During the Civil War, the writer sided with the South, and served in the Confederate Army only for a couple of weeks before heading West to San Francisco where he prospected for silver and gold before resuming his journalism career. He moved to Hartford, Connecticut in 1874. Harriet Beecher Stowe, author of Uncle Tom’s Cabin, was his neighbor. Mark Twain started a publishing house that soon went bankrupt. He had debts most of his life due to bad investments. 3 of his 4 children died before him. Ernest Hemingway was a fan of Mark Twain, especially of his work The Adventures of Huckleberry Finn.